I ran across a ‘Tweet’ by Jennifer Dukes Lee yesterday that moved the needle on my enthusiasm gauge more than a little towards the high end. It read, “I am not a hypocrite or a crazy person if I preach happiness one minute and weep the next . . .” Nineteen words from the social media account of a person I’ve never met perfectly sums up the goal of my blogging efforts. Linked to the post was a picture with a partial quote of Hebrews 12:2: “For the joy set before him he endured the cross” (NIV). Grab your Bible or open your favorite Bible app and look up that entire verse. There is no reasonable compatibility with “joy” and “the cross.” Crucifixion was intended to inflict anguish and humiliation. The pain of the process was horrific and intentionally inflicted. The joy that was set before Jesus was doubly motivated by: 1) his love for the people he was dying to save; and 2) his understanding that neither the cross nor the grave would be the end of the story. One of my pet peeves of children’s ministry is that we tell our kids a Gospel that seems incomplete. Our kids make it to middle school and their understanding of the Gospel is that “Jesus died on the cross for my sins.” And He did. But the story has an epic conclusion that’s often remembered as an epilogue afterthought. What happened on the cross on Friday was necessary to pay for sin; Jesus did for humanity what humanity couldn’t do for itself. Jesus didn’t JUST pay for our sin, though. In the resurrection he showed that He is more powerful than sin (and death, and hell). The days leading up to Easter are my favorite period of time to be on social media. The screen is an incessant parade of memes and quotations, pictures and Bible verses reminding us of the greatest reason in history to celebrate. For all of the gory details about Friday afternoon and the miraculous glory of Sunday morning, the Scripture is conspicuously quiet about Saturday. Therein lies our dilemma: we live in a Saturday world. We’re caught between the Friday of grieving over real hurts and the hope of a Sunday resurrection that’s coming but not yet here. Jesus endured the cross with joy because He knew how the rest of the story would unfold. The believer in Christ is in the position to know that the rest of the story applies to us as well. Paul wrote in his first letter to the church in Thessalonica, “Brothers and sisters, we do not want you to be uninformed about those who sleep in death, so that you do not grieve like the rest of mankind, who have no hope. For we believe that Jesus died and rose again, and so we believe that God will bring with Jesus those who have fallen asleep in him” (I Thessalonians 4:13-14, NIV). DISCLAIMER: Here’s the part that may evoke wrath. Which group are you in? Are you one of the brothers and sisters who is fully informed, or are you part of the general population who grieves without hope? That’s an “either/or” proposition, it can never be “both/and.” Contrary to popular belief, being dead is not the only prerequisite for going to heaven. I’ve sat in attendance in some funerals and – while hearing the eulogy – double-checked the program to make sure I was at the right place. On a couple of sad occasions, I’ve had to temper the expectations of families in mourning regarding what I could or would say about a deceased loved one. Biblical Christianity is the ONLY worldview that can logically make sense of the problems of evil, the ONLY belief system that can satisfactorily answer the question of why bad things happen, and the ONLY faith that offers real hope after the problems of evil and bad things have been contemplated. We don’t all serve the same God in different ways. There aren’t many ways that lead to heaven; there’s only ONE way and His name is Jesus. John 14:6 is a familiar verse to that end. All over the world on this day of celebrating the resurrection, pastors and preachers will pull from so many different Bible passages to build on the theme of hope that is found through the Gospel of Jesus. I want you to have that hope, including and especially as you grieve. While you cry on the Saturday of life, I want you to be looking ahead through your tears to the Sunday that’s coming instead of being trapped and unable to take your eyes off of Friday. On Sunday morning, women who grieved more deeply than anyone else over Jesus’ death showed up at the tomb to finally give his body the treatment it deserved. They didn’t get up early with the notion they could do anything to change circumstances, they only sought to bring some dignity to the process and some closure to their wounded hearts. Disappointment, confusion, and even panic ensued when they found no body – literally – where there was supposed to be one. Matthew 28:5-6 reads, “The angel said to the women, “Do not be afraid, for I know that you are looking for Jesus, who was crucified. He is not here; he has risen, just as he said. Come and see the place where he lay” (NIV). If you’re one of the masses who hasn’t found faith in Christ, then those words will have no power or meaning for you. If you’re a ‘brother’ or ‘sister,’ though, they hold a wealth of eternal promise and hope that overcomes our present & temporary trials. Enjoy the daffodils, and happy Easter! I love the 1 Thessalonians 4:13-18 scripture. I was of some age before I found that scripture and wrapped my brain around it. What a thrill that I could put my name in the list, dead or alive. I will be raised up to meet Jesus in the air and go to be with my Heavenly Father forever. I do hear so many people expressing doubt about this and having a difficult time believing it. Not me! I have a sister in heaven. She was 11 months younger than me and only lived a few hours. Some may ask why she was born at all. I believe she served the purpose of playing a part in my acceptance of Jesus as my Lord and Savior. I know she will be in heaven so I will have the opportunity to see her. I will be able to see my precious Donald again. 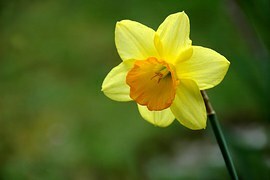 This is a simplistic view of the scripture from me, but in the Daffodil Garden “It is Huge”. Thank you Andy for your blog.